Giving Back for a Good Cause! Attention Getters at San Vicente Golf Club……. 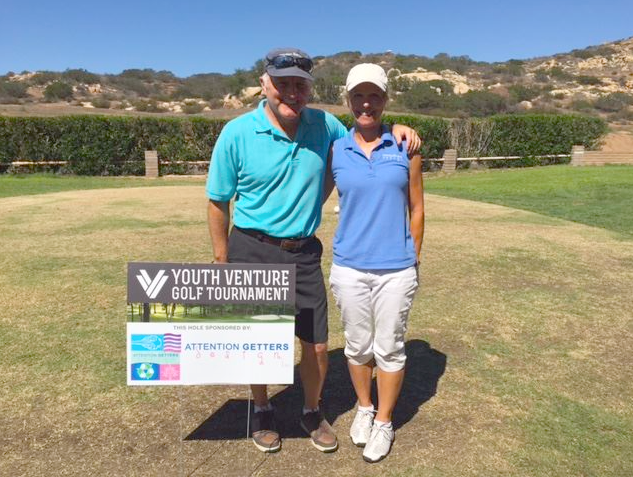 Golfing to raise money for East County’s Youth Venture Program! We provided all the signage for this event as a sponsor, and played in the tournament to show our support. Youth Venture is a free community service program for kids 10-18 that provides a free, safe and fun environment to play, gain mentor ship and grow as young adults. Each year the tournament provides a major source of the funding for this non-profit organization created by Foothills Church. As one of the most influential youth programs, they have helped thousands of teens in the San Diego/East County area. Way to go and be an Attention Getter! Check out our golf signs page when you need golf signs for your next tournement! Giving back at the Youth Venture Event! Giant inflatable balloons painted for Sea World. Great design means attention and readability! New feather banner for a health and exercise company! 25 Years in the Making!